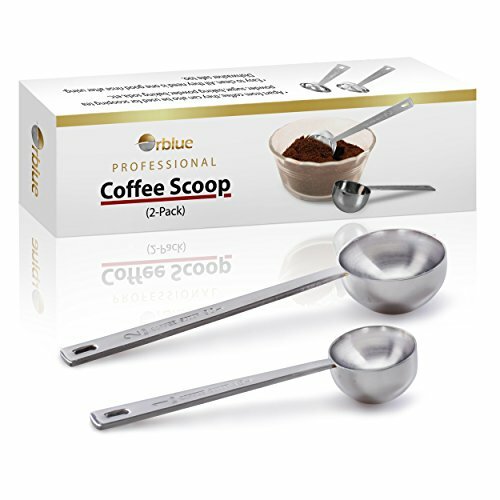 This pack of 2 coffee scoops by Orblue is perfect for coffee lovers and enthusiasts who enjoy a quality cup of coffee, or those who just appreciate having the right spoon for the job. With two different measuring options, 1 tablespoon measures 15 ml and the other 2 tablespoons measures 30 ml. Unlike the flimsy plastic coffee scoops that break easily or warp in the dishwasher, these scoops are made from stainless steel, and are sturdy, rust-resistant, and durable. These two long handle coffee scoop make it easy to get to the bottom of tall containers and standard coffee bag scoop. The scoops have good depth meaning fewer or no spills at all. They are just the right weight, heavy enough to not bend but lightweight enough for easy use. Featuring high polish finish, these scoops are practical as well as great looking. Being multi-purpose, they can be used to measure things other than coffee, like tea powder, sugar, baking powder, baking soda, etc. Since the spoons are made from stainless steel, they will not retain any flavors even if you use it with different varieties of tea. They are very easy to clean. Just rinse them off after using and you're good to go. They can also be washed in dishwasher. Their compact size makes them easy to store in kitchen drawers. Each spoon also has small hole on one end, so they can also be hung on the kitchen hooks. This coffee scoop kit makes for a great gift item for coffee aficionados. 2 stainless steel measuring scoops for coffee, 1 Tablespoon (15 ml) and 2 Tablespoon (30 ml), so that you get a perfect cup of coffee every time. These 2 coffee scoops feature long handles making it easy to scoop the coffee from tall containers and coffee bags without getting coffee grounds all over your fingers. Stainless steel coffee scoops feature sturdy construction, high polish finish, and great appearance. Apart from coffee, they can also be used for scooping tea powder, sugar, baking powder, baking soda, spices and other condiments. Easy to clean. All they need is one good rinse after using. Dishwasher safe too. Very convenient to store. Each of the coffee measuring scoop has a little hole on one end that can be used to hang the spoon on a kitchen hook.